I’ve actually heard of the existence of a group of people who want some of their limbs cut off in order to be complete, but I can’t pinpoint exactly where I heard it from before. Hence, the subject matter of the film wasn’t that shocking to me. 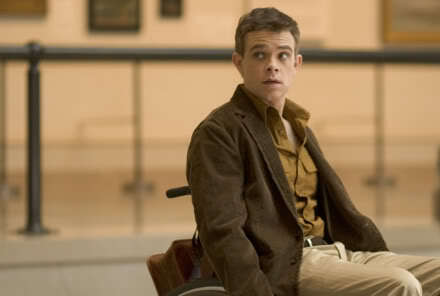 Nick Stahl is one of my favorite actors to watch because he always manages to use his charisma to his advantage. Most of the time, I find it very difficult not to identity with his character because his face has a certain sadness that makes me want to know more. A lot of people might quickly write him off for playing the same role time and again but I think his acting has subtlety so each role is a little different than the other. In “Quid Pro Quo,” although his character has learned to embrace his disability, he stumbles upon a pair of shoes that can magically make him walk. Even though that may sound literal and a bit unbelievable, I think it’s more symbolic than anything else which can be backed up toward the end of the picture. After he wears the shoes, it made me realize that maybe he’s not so comfortable with being a disabled person after all no matter how strong he tries to be. Maybe he repressed his frustration so much that he forgot how important it is for him to be able to walk again. Vera Farmiga is just as complex. While Stahl wants to walk, Farmiga wants to be paralyzed. Just when I thought I got her all figured out, such as why she wants to be wheelchair-bound, a piece of information is introduced at the end of the movie which can explain why she wants to be paralyzed. In a strange way, this reminded me of “Secretary” (although not as twisted and darkly comic). Both are strange but still manages to be sensitive with the subject matter and not look down on people who do lead such lives. A first time writer and director, I think Carlos Brooks has it in him to make a great film in the future.